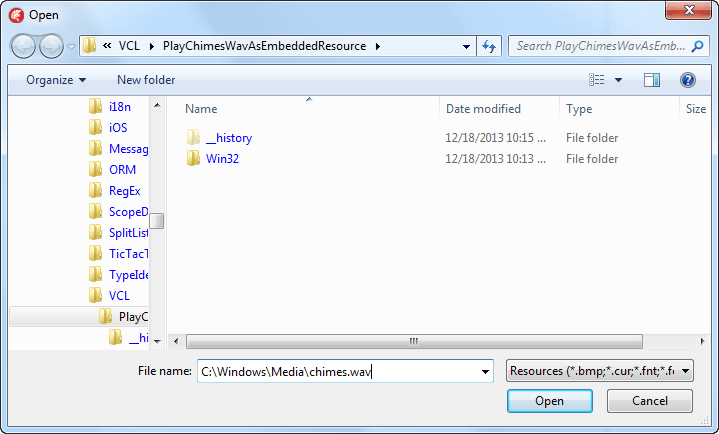 The thing that more recent Delphi versions made a lot easier is embedding WAV files as WAVE resources, more on that further on. SND_NODEFAULT makes sure no other sound gets substituted if the file or resource cannot be found. SND_ASYNC plays the sound asynchronously in a separate thread so your main thread continues to execute while the sound plays. SND_SENTRY is for [WayBack] Windows Vista and up to notify hearing impaired in a visual way that a sound is being played through a SoundSentry event. It uses the nil as a sound parameter in combination with the SND_ASYNC flag to stop playing any sound that started using the PlaySound or sndPlaySound functions in your application. This is also a one-liner. 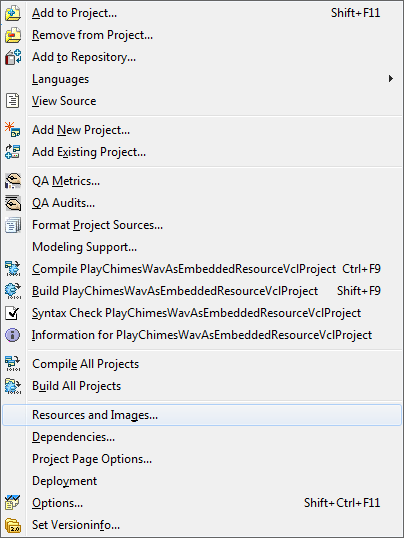 The initial demo project is a bit larger, as it involves a VCL Form and a project just for the single purpose on showing how the project will change when embedding a WAVE resource. In the past this was overly complicated: people were manually assembling RES files, or wrote [WayBack] RC scripts to create RES files and included those in Delphi. Performing the above steps result in a few very interesting changes in your Delphi project. Use the resource name, not the file name. 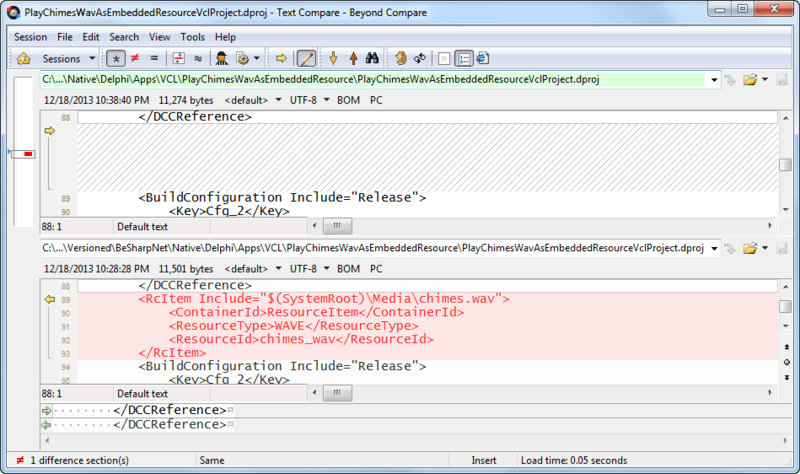 Note there is no need any more for uppercase resource names, but there cannot be any periods in them as the [WayBack] valid characters in resource names are limited to A-Z, a-z, 0-9, and underscores ( _ ) and resource names must be unique in the scope of the application (not only the resource file). So there is [WayBack] no need to use FindResource, LoadResource, LockResource, nor [WayBack] TResourceStream. You still can, but that makes it overly complicated. With the PlaySound solution above, you might need to cast the string of the filename or resource name to PChar if you pass the string as variable, but that is about as complicated as it gets. I haven’t included an example for playing sounds from memory. The reason is that using [WayBack] SND_MEMORY with SND_ASYNC requires you to make sure [WayBack] the memory buffer lasts longer than the sound will play. And since the sound plays asynchronously in a separate thread, you have to make sure the memory outlives the thread. Which can be hard. As of Windows 7, Microsoft fixes this by buffering up to a maximum of 2 megabytes of WAV data for you, but still you need to be careful. When you want to play sounds in a cross platform way, you need to look into the FireMonkey [Archive.is] FMX TMediaPlayer. That is beyond the scope of this blog post, but a [WayBack] Delphi XE4 example is here. This entry was posted on 2018/01/10 at 15:00	and is filed under Borland Pascal, Delphi, Delphi 2, Delphi 2005, Delphi 2006, Delphi 2007, Delphi 2009, Delphi 2010, Delphi 3, Delphi 4, Delphi 5, Delphi 6, Delphi 7, Delphi XE, Delphi XE2, Delphi XE3, Delphi XE4, Delphi XE5, Development, Pascal, Software Development, Turbo Pascal. You can follow any responses to this entry through the RSS 2.0 feed. You can leave a response, or trackback from your own site.